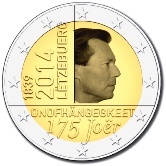 This coin celebrates the 175th anniversary of the independence of Luxembourg. This guarantee of independence was granted in 1839 by France, Great Britain, Prussia, Austria and Russia. The design is interesting. The inner circle is divided into three sections by two lines, one running horizontally and the other vertically. They, as a matter of interest, break the rules regarding coin design. It was decided in 2013 that the outer ring was only to contain the twelve stars of the EU. The afore mentioned lines however, extend to the edge of the coin, effectively dividing the stars into three groups and so offending the idea of unity within the EU. In the upper left section, we see the year independence 1839, the year of issue, the name of the issuing country in the local language and the mint mark. In the upper right section is a portrait of the Grand Duke – Henri – looking to the right. Finally, in the bottom section we have the inscription “ ONOFHÄNGEGKEET 175 Joër “. This is in the local language and stands for – Independence 175 Years”.